It’s been four months since the Jawa classic and the Jawa Forty-Two were launched in India, and the bikes are yet to be delivered to customers. That said, the company has now revealed through social media that handovers will commence in March-April for the customers who have booked in November 2018. Deliveries for the Jawa classic and Jawa Forty-Two single-channel ABS variant will commence from March, while dual-channel ABS variants will be delivered from June 2019. Jawa Motorcycles India is on a dealership launch spree, with the latest being the inauguration of the Indore showroom. The company is well on its course to have 105 functional outlets across India in the coming months. At the launch of the new Jawa bikes, the company had showcased the Jawa Perak factory-custom bobber, priced at INR 1.89 lakh (ex-showroom Delhi). 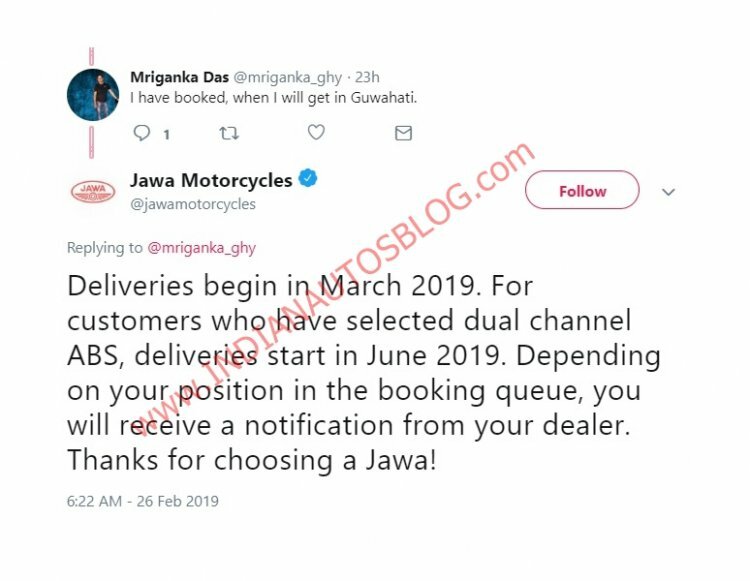 Jawa Motorcycles has confirmed to IAB that deliveries of the Perak bobber will commence from September 2019. The Jawa bikes are sold out till September this year and waiting period has shot up to six months. While the Jawa classic rivals the Royal Enfield Classic 350, the Jawa Forty-Two will lock horns with the Royal Enfield Thunderbird 350X. The Jawa classic is priced at INR 1.63 lakh* (single-channel ABS) and INR 1.73 lakh* (dual-channel ABS). The Jawa motorcycles employ a 293cc, DOHC liquid-cooled motor that puts out a maximum power of 27 bhp and 28 Nm of peak torque, coupled with a six-speed transmission. The motorcycles either come with single-channel or dual-channel ABS units. While the former features a front disc and a rear drum brake setup, the latter gets disc brakes at both the ends.